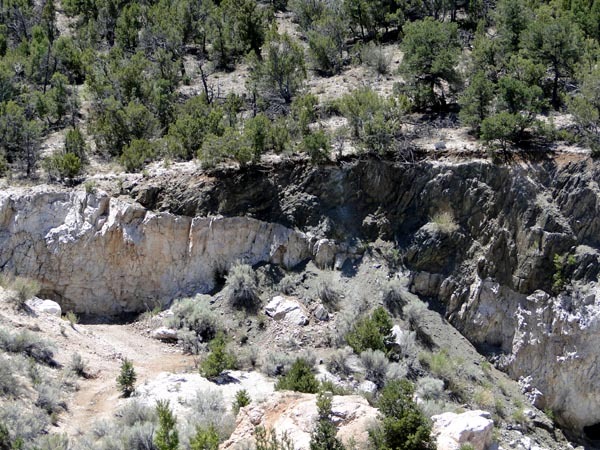 To see Harding mine on Google Earth, please click here. 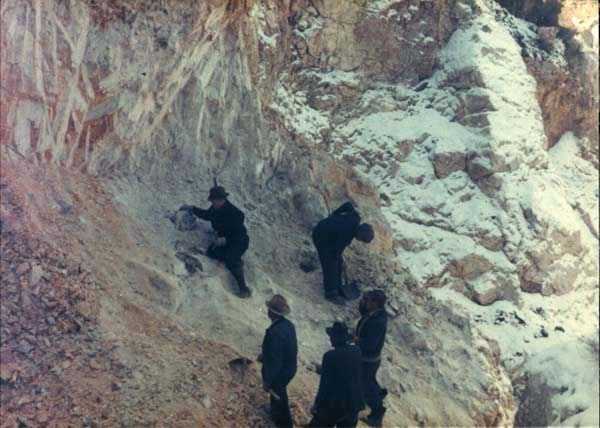 The Harding mine in New Mexico was mined from about 1900 intermittenly until 1958 as source for various metals such as beryllium, lithium and tantalum. It is an interesting counterpiece to the Etta mine in South Dakotah. As in the famous Etta mine we have giant - though somewhat smaller - spodumene crystals in a quartz - feldspar pegmatite, which were and which still are (!) beautifully exposed in a long mine wall. Rather than forming individual logs the white coloured spodumene crystals grow in fan like shapes from the lower part of the pegmatite, sometimes forming large stellate aggregates. Strange enough a completely different occurence of giant crystals can be found only some 150 m away from the Harding pegmatite. Here a rocky outcrop called "Iceberg Claim" was explored and mined in the 1930s for optical calcite / icelandic spar. The individual anhedral - that is : non idiomorphic - calcite crystals discovered and mined reached a dimension of several meter and were in large parts of remarkable clarity. V.C. KELLEY (1940) wrote an extensive report about these icelandic spar crystals. After abandonment of all mining activities 1978 the whole property was donated to the University of New Mexico, which still owns it today and carry out geological research in the Harding area. 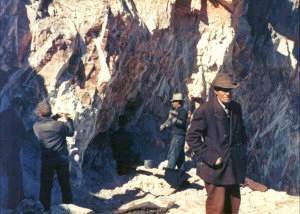 The mine and the surrounding is therefore a protected geological heritage site, which is still open to all geologically interested students and parties. Spodumene and Iceland Spar Calcite as giant crystals with feldspar, mica and other minerals as pegmatite matrix. The slender spodumene laths reach several meter in length, while anhedral icelandic spar (calcite) crystals of up to 40 tons (no dimensions given) are reported. 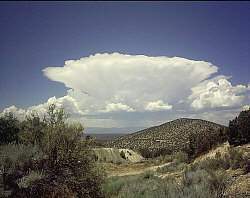 The property is owned and protected by the University of New Mexico, which is conducting geological research and fieldtrips for visitors in the area. A giant crystal locality as it should be. Accessible to science and the general public alike, though protected by law and the scientific community. 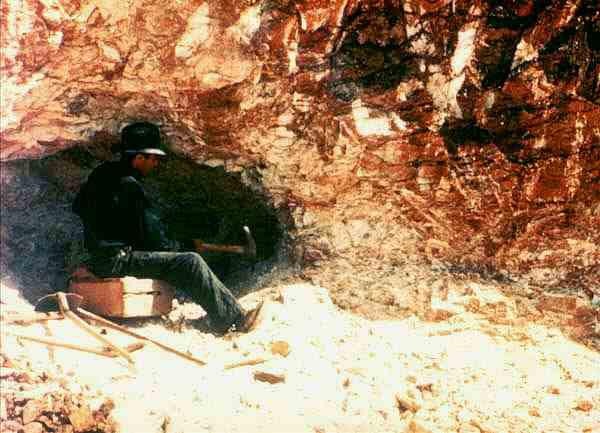 - A further well known north american spodumene locality is the Etta mine near Keystone in South Dakota, where a multitude of up to 14 m long spodumene "logs" = crystals have been encountered during mining operation. For more information about the Etta Mine click here. - The largest known european spodumene deposit with rich reserves and many rare minerals is the well explored, but never seriously mined Weinebene pegmatite at the Koralpe, Carinthia, Austria. - Gemmy spodumene of the pink variety known as kunzite can reach up to 1 m crystal size and are reported both from Brazil as well as from the Nuristan region, Pakistan. - Another remarkable Iceland spar deposit with crystals up to 0,7 x 0,5 cm occur in basalt from Nizhnyaya, Krasnoyarsk kray Siberia, GUS. - Sharp yellow scalenohedral crystals up to 1 m occur with galena and sphalerite in the famous Tri State District, Oklahoma / Missouri / Kansas, USA. - Large to giant crystals of calcite up to 1 x 1 m size from metamorphic marbles have been reported from Sterlingbush, New York, USA. - As calcite is one of the most common minerals, there are certainly other remarkable giant crystal occurences not listed here. For more information on the mineral spodumene please have a look at www.mindat.org, Webmineral and the german Mineralienatlas. about the giant calcite crystals found on the Iceberg claim nearby. Have you been at the site ? Do you have any comments or want to discuss the topic with us ?